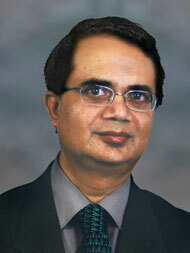 Dr. Mokshagundam joined the University of Louisville faculty in July 1992. He obtained his medical degree and initial internal medicine and endocrinology training in India. After teaching at St. Johns’ Medical College in Bangalore, India for 2 years, Dr. Mokshagundam pursued a research fellowship at the Frazier Laboratories for Diabetes Research, McGill University, Montreal, Canada. He came to the US in 1988 and completed Internal Medicine residency at New York Medical College and clinical fellowship in Endocrinology and Metabolism at Albert Einstein College of Medicine, New York. He is a member of the American Diabetes Association, Endocrine Society, American Association of Clinical Endocrinologists, and the Obesity Society. He is on the Finance Committee of the Endocrine Society.